Dartmouth's Cole Jacobsen talks the big win. BRIDGEWATER, Mass. – While they’ve lost several critical pieces from last year’s state championship winning team, the Dartmouth Indians have retained one fearless and versatile leader. Senior quarterback Cole Jacobsen did a little bit of everything for No. 16 Dartmouth on Friday night, as he rushed for 182 yards, passed for 56 more, and came up with an interception during a 13-6 victory at No. 6 Bridgewater-Raynham. Indeed, Dartmouth (5-0) seemed to have a bead on the Trojans' run-first offense. The visitors held Bridgewater-Raynham (3-2) to just 62 rushing yards on 16 carries in the first half, while jumping out to a 13-0 lead, thanks to Jacobsen’s exploits. Jacobsen, who also plays free safety, read the eyes of Trojan quarterback Corey Sullivan, and came up with a critical interception in the waning seconds of the first quarter. On the first play of the second frame, he found teammate Luke Clarke for a 21-yard touchdown pass to open the scoring. After Dartmouth’s loaded defense forced a punt, Jacobsen broke an incredible 72-yard touchdown run on third-and-long to make it 13-0 and break the 100-yard rushing mark before halftime. 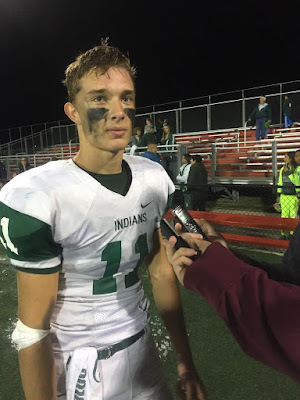 Running the read-option with tremendous success, Jacobsen generated all the offense the Indians would need, as their defense proved strong enough to pull out the win. In the second half, Bridgewater-Raynham was able to get its ground game going to an extent, as Shawn Noel (12 carries, 33 yards, TD) rushed for an eight-yard score to make it a one-possession game, but the Trojans would not cross the Indian 30-yard line again. Seniors Colin McCabe, Liam Caulfield, Valentino Aiello and Nolan Fonseca controlled the line of scrimmage, and linebacker Max Szteliga came up with an interception to essentially seal the game with under three minutes to play. White praised Jacobsen’s leadership and growth since he became the starter last season. After all, the senior has now led Dartmouth to 13 straight wins, including a second consecutive state title last December. But more than any single player, the veteran coach gave credit to his defense for this monumental victory.